The letters remain this morning. The tide hasn’t erased them. They’re not as sharp as they were yesterday, not as perfectly defined. The wind has blurred their lines. But the words are still readable. 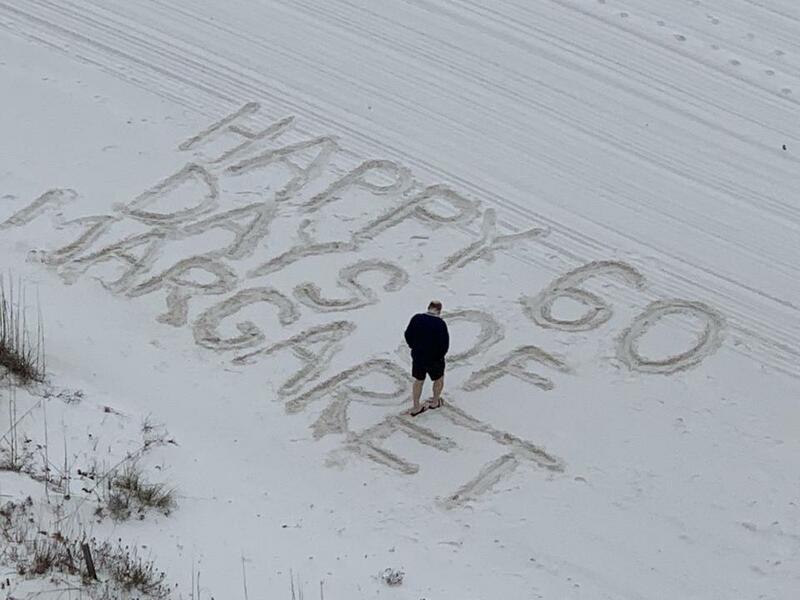 HAPPY 60 DAYS OF MARGARET, they say, a billboard in the sand. I watched yesterday from a balcony 11 stories above the ocean as a man using his sandaled feet as tools created these block letters. It seemed easy for him, as if it were a dance he’d done dozens of times before. He didn’t stop to measure. He didn’t stop to assess. He went from letter to letter, from word to word with practiced ease. It was early morning, before 8, and the beach was gray and empty. The man worked alone, in silence and in solitude. He started with the word “Margaret” and worked his way up and backwards to “happy.” It took him less than 10 minutes. But on vacation with nothing to do? The “what ifs” lassoed me. I studied this man. I couldn’t see his face and his back was to me. I could see only that his shoulders slumped. Did they slump because he was focused on his feet, because he was looking down and paying close attention because it isn’t easy to make perfectly spaced big, block letters in sand? Or did they slump because he was an old man remembering a Margaret he had loved long ago for 60 perfect days? Or was Margaret a child he had loved who lived only 60 days, or a woman who had long ago left him. Maybe she was a grandchild who, on this overcast morning, was exactly 60 days old, HAPPY 60 DAYS OF MARGARET a celebration. Or maybe Margaret was just his latest girlfriend, 60 days not long enough to take the blush off the rose. The man’s body language gave away none of this. He didn’t seem propelled by either happiness or sadness. He was just a man at work, etching out words in the sand. The beach was still empty when he finished. He retraced his footsteps making the letters even more defined. Not a single person was there to applaud. Not even a gull bothered to pause in its flight. But the man paused. When he finished, he stood up as straight as the T he was standing next to, lifted his hands and spread out his arms. If I had blinked I would have missed it. His gesture was that fast. And then it was over. Was someone watching from another balcony? I saw and heard no one. And the man didn’t wave or bow or ham it up or do any of those things a person who is performing for an audience might do. He made that one, quick gesture, as if to the universe, then turned away and walked down the beach. He never looked back. I watched him for as long as I could see him and he never turned around. It’s a grayer day today. The wind is whipping up. The tide is coming in. A beach sweeper has made one run already. By tomorrow his billboard in the sand will be gone. Maybe 60 days are all he got with her. Or maybe there are more happy days to come. I don’t know. What I do know is that in the early morning on an empty beach a little west of Pensacola a man wrote a love story in just five words. Beverly Beckham’s column appears every two weeks. She can be reached at bev@beverlybeckham.com.